The Economic Outlook: 2014 – 2024 II. How Can We Grow Faster? Last week I summarized the latest economic report from the Congressional Budget Office which very clearly describes both the slow rate of growth of our economy since the end of the recession, the enormous buildup of our national debt in the past five years and also the likelihood that it will continue getting worse for the foreseeable future unless big changes are made. 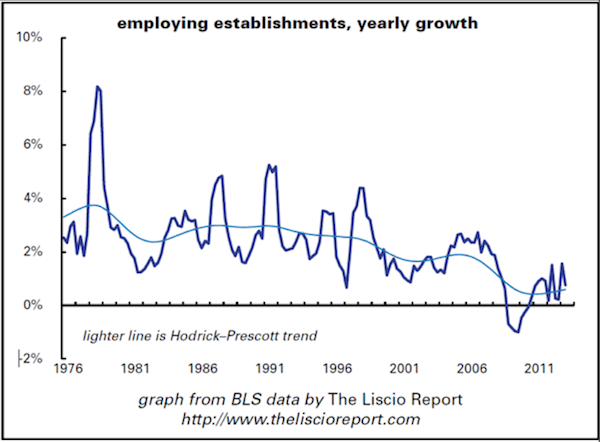 About a week ago the two economists Edward Prescott and Lee Ohanian had an Op Ed in the Wall Street Journal, “U.S. Productivity Growth Has Taken a Dive”, pointing out that the productivity of U.S. workers has grown at an average annual rate of only 1.1% since 2011, much lower than the average annual rate of about 2.5% since 1948 (see the above chart). They also point out that the rate of new business creation is 28% below where it was in the 1980s (see the chart just below). 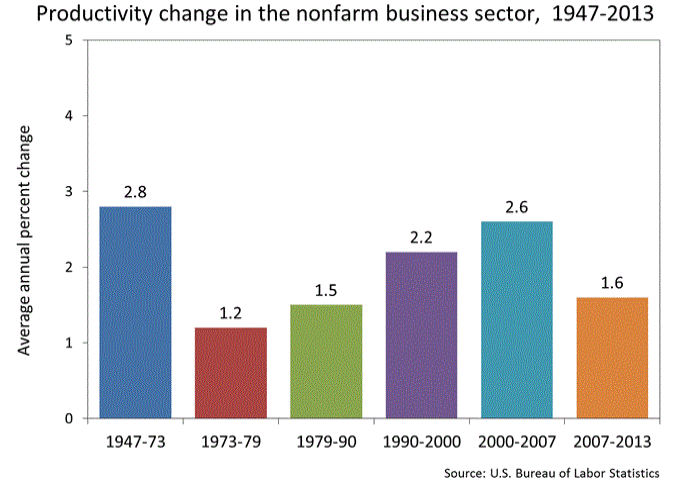 Growth of worker productivity and growth of new business formation are the two main forces which drive economic growth. The best response to this pervasive attitude is to shift the conversation towards equality of opportunity rather than dwelling on income inequality. By far the best way to increase opportunity for those who desire it and are willing to work for it is to grow the economy faster in order to create more and better jobs. If we are able to do this, we’ll all be much better off. This entry was posted in economic growth, Edward Prescott, entrepreneurship, equality of opportunity, GDP, income inequality, Lee Ohanian, pro-growth economic policy, Uncategorized, Wall Street Journal, worker productivity and tagged economic growth, Edward Prescott, equality of opportunity, income inequality, jack heidel, Lee Ohanian, Wall Street Journal by jackheidel. Bookmark the permalink.